You are here: Home / Health & Diet / Is Egg Vegetarian Or Non-Vegetarian? Is Egg Vegetarian Or Non-Vegetarian? As egg is not a meat, it is often considered as vegetarian. However, many people regard eggs as animal products and hence, categorize eggs as non-vegetarian. Thus, several arguments and counter-arguments raise doubts as to whether eggs are vegetarian or not. As a result, vegetarians who eat eggs are referred to as ovo-vegetarians. Those who consume dairy products, too, are called lacto-ovo-vegetarians. Basically, vegetarians follow a plant-based diet and abstain from meat products. Coming to the confusion regarding the status of eggs as vegetarian or non-vegetarian, let’s start with chicken. Chicken eggs can be fertile or infertile. Usually, hens start laying eggs when they reach puberty and they ovulate every 24 to 48 hours. These eggs are produced even when the hen is not mated. Hence, if there is no cockerel to inseminate the yolk in the hen’s cloaca, the eggs are not likely to be fertilized. Consequently, an infertile egg that does not contain an embryo is not going to hatch. Ethically speaking, though, eggs are considered as carriers of life and progeny (as they have potential for life, provided there are sperms for fertilization). Hence, they are not classified as strictly vegetarian. There are still various other points that eventually lead to an endless debate on this topic. Regular consumption of eggs increases the risk of developing cardiovascular disease and prostate cancer. They are rich in cholesterol which, in turn, contributes in the accumulation of plaque in blood vessels. An egg itself contains about 213 mg cholesterol whereas a healthy diet lays emphasis on having less than 300 mg per day. Nevertheless, the cholesterol present in eggs is not as harmful as saturated fats. It is recommended to avoid eating raw eggs as they are likely to cause food poisoning. They are not fit for consumption because raw and lightly cooked eggs (particularly unpasteurized) may contain salmonella bacteria, E.Coli, and so on. Coming to the benefits, an egg is a good source of protein. Plus, it contains vitamin A, vitamin B2, vitamin B5, vitamin B12, vitamin D, vitamin E, vitamin K, iron, selenium, choline (good the nervous system and boosts brain development), etc. Furthermore, it prevents blood clots, thereby reducing the chances of having strokes or heart attacks. 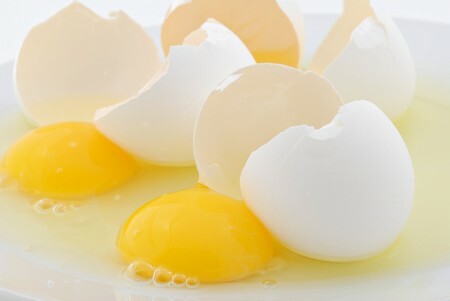 In addition, egg yolks help increase the bioavailability of a carotenoid called lutein, and hence protect against age-related macular degeneration. A properly planned vegetarian diet is considered as healthy and nutritionally adequate even though it excludes meats. In fact, it helps prevent diseases like high cholesterol, hypertension, heart disease, type-2 diabetes, obesity, dementia, and certain types of cancers. Thus, people usually adopt this diet for religious, ethical, and health-related reasons. Vegetarianism is often confused with veganism but there is a difference between the two as the latter emphasizes avoidance of animal products and by-products as well. Thus, a vegan diet only includes plant-based products and hence, rejects dairy products, eggs and other foods derived from animals as an objection to the exploitation of animals.